Tonya Kuper, author of Anomaly, will be joining Lindsay Cummings, Lynne Matson, Paula Stokes, Jaye Robin Brown, and Robin Constantine and Anne Blankman for the Southeast Summer Book Bash!!! 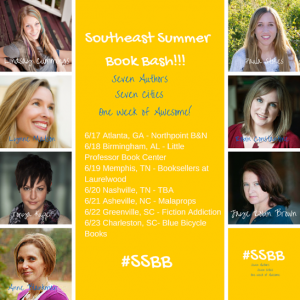 Seven authors, seven cities, and one week of awesome! Make sure to come out and support our amazing author and her book, Anomaly. The second book in her Schrodinger’s Consortium series, Enigma, comes out this October!